The Summer Eurythmy Week August 7-14 2015, in Angus Ontario, was full of surprises! After driving past endless fields, hills, cows and forests, it was a miracle to arrive at tranquil “Camphill Nottawasaga!” My mouth dropped open when I saw the “Novalis Hall.” What empowering architecture! The beauty, the wooden floors, the grand piano and the wonderful stage…waiting! My ideal eurythmy holiday was just beginning. The nicest surprise was the genuine welcome! Standing on my point of the seven-pointed star, I felt I belonged. Thank-you to all who shared their space with us, prepared our lovely meals, put us up, and applauded our performances. Gabrielle Schneider held the many practical, artistic and social strands together with her light touch. She led us through many basic exercises such as “I and You”, “The Energy and Peace Dance”, “The wishes of the Soul”…and we found them inwardly nourishing and formative. And surprise! We had to do two public performances….That meant we had to work and not shirk, during our intensive days together! Gabrielle also invited her lay class to join us, and they fuelled the work with their enthusiasm! I realised how lucky I am to be a trained eurythmist…and that eurythmy needs to be shared in the world. A real circle of friends grew out of the heartbeat of eurythmy. Professional eurythmists from the East and West of Canada met in the centre. Johanna from Chicago and Marjorie Taliano Nordaas from the North (Oslo, Norway) completed the compass making us fourteen participants. Marjorie had been touring her M.A. program ”Remembering Fuego” with her gifted concert pianist Jie Zhang, who incidently played for some of our tone classes and my Schubert “Nocturne” solo! Marjorie gave a professional performance, a tremendous master class on Grieg’s Tone Form, leading us into the elemental quality of Norway, and shared indications for flute. One afternoon we bathed in the sweet sounds of a lyre duo, John Billing and Chio, who made a stop on their international tour. Other fun moments included roasting potatoes on the campfire, washing endless dishes, clay modelling, the cows (which Gabrielle called the “kindergarten”) and chatting in the change room amidst the flurry of dresses and veils. I can’t wait to see “Nymph and Goblin” again, and the four Elements” by the Barrie Group. What an achievement! Moving forward in the same spirit of community building through eurythmy, I would like to announce a summer eurythmy conference for Eurythmists and Enthusiasts, here in beautiful Nova Scotia! The North American Youth Section (NAYS) would like to offer a new monthly newsletter full of constructive insight on the topic of Love in its highest form, or "Agape" to affirm positive action in 2016. While some of us contributing writers are located here in Chestnut Ridge, most are spread across the continent. This newsletter is the beginning of a new cycle of projects after recently culminating in St. Louis this last October during a general meeting of the Anthroposophical Society. I see the Gesture of our newsletter as one that affirms a few simple claims. First: that Love is an appropriate tool for all situations. Second: that Love is the source of genuine behavior. Finally, that Love enables us to be human. As a young person inheriting the world, I am in a near state of paralysis. My desire to initiate this newsletter with the topic of Love is informed directly by the November Attacks in Paris. However strongly the fanatic inspires fear in me, I believe that which opposes us in our personal lives is not limited to the extremist. Anything can be in opposition to who we are and actually there are times when it should win over us. In our second coming newsletter (February, 2016) we will examine that which opposes us as an Entity: “The Other.” We will seek to gain insight as to what the Other is representative of in humanity. Another hope is that this newsletter will be a space where we are encouraged to imagine the disposition of the Other. I feel the Other offers us unique opportunities at every encounter - like whether to choose Love or not? What the Other needs most is someone to witness it and the unsympathetic forces that guided its development. To choose Love means to recognize these facts and begin the process of relieving the Other from its stigma and us of our prejudices. The feeling is that we must see all problems and all people as human again in order to Love them properly. An Enormous step in this direction would be to actively explore the role we ourselves have played as one of these unsympathetic forces. Perhaps as our moral imagination develops in the space (which is small at first) that we hold for the Other, we may simultaneously begin to realize that this space, and this space alone, is the only room in the whole world where the Other is Free. Salutations chaleureuses et Bonne Année! 2016 promet d'être une année riche en événements importants pour la Société anthroposophique au Canada. Le nouveau site internet de la Société sera en ligne sous peu. L'important congrès nord-américain À la rencontre de notre humanité aura lieu à Ottawa au mois d'août. On pourra y entendre un grand nombre de conférenciers de marque, participer à d'excellents d'ateliers artistiques et écouter des présentations de recherche (voir l'interview d'Arie van Ameringen paru dans le numéro d'hiver d'Aperçus/eNews). Vous pouvez dès maintenant visiter le site du congrès pour voir toute la programmation et pour vous inscrire. Ne manquez pas cet événement important! Un grand merci à Gary Burak qui a conçu l'admirable design du site et à Jean Balekian qui a créé le logo du congrès. Le dépliant annonçant le congrès sera envoyé à tous les membres de la SAC vers la fin du mois de janvier. Ce dépliant vous fournira tous les renseignements nécessaires pour vous inscrire au congrès par la poste. Un événement significatif qui a eu lieu au début de cette nouvelle année, c'était le déménagement de la bibliothèque de la Société de son local au sous-sol de Hesperus à une salle située au deuxième étage. Cet espace est moins grand, mais plus beau et très éclairé. Une cérémonie d'ouverture aura lieu le 5 février prochain, de 19 h à 20 h. Nous vous invitons cordialement à vous joindre à nous à Hesperus pour admirer les nouveaux locaux, partager une collation et participer à la conversation. Un des résultats de ce déménagement est qu'il nous reste une série de volumes en doubles exemplaires pour lesquels nous n'avons pas de place dans ce nouveau local. Nous sommes prêts à offrir ces livres de Rudolf Steiner aux groupes et branches qui désireraient augmenter ou mettre sur pied leur propre bibliothèque locale. Je tiens à ajouter que nous avons l'intention de favoriser le travail des groupes et des branches de toutes les manières possibles. Nous lancerons sous peu le site internet de la Société sur lequel il y aura un espace pour chaque groupe et chaque branche. Nous vous encourageons de nous faire savoir vos suggestions sur comment nous pouvons mieux travailler ensemble. Warm greetings and Happy New Year! 2016 promises to be a big year for the Anthroposophical Society in Canada. The website for the Society will be launched shortly. We have the North American conference Encountering Our Humanity in Ottawa in August, with its wealth of speakers, artistic workshops and presenters (read interview with Arie van Ameringen in Winter Glimpses/enews). You can now see all the information on the website, and register there. You won't want to miss this event! Many thanks to Gary Burak for such a beautiful design for this website, and to Jean Balekian for the design of the conference logo. There will be a brochure about the Conference mailed out to all ASC members at the beginning of February, which includes details for registration by mail. As we begin this year, the library collection of the Society has moved from the basement of Hesperus to a smaller room on the second floor. This is a lovely space, with lots of light. There will be an opening to celebrate this new location, on February 5th, 7 to 8 pm. Please join us at Hesperus for a viewing, conversation, and refreshments. 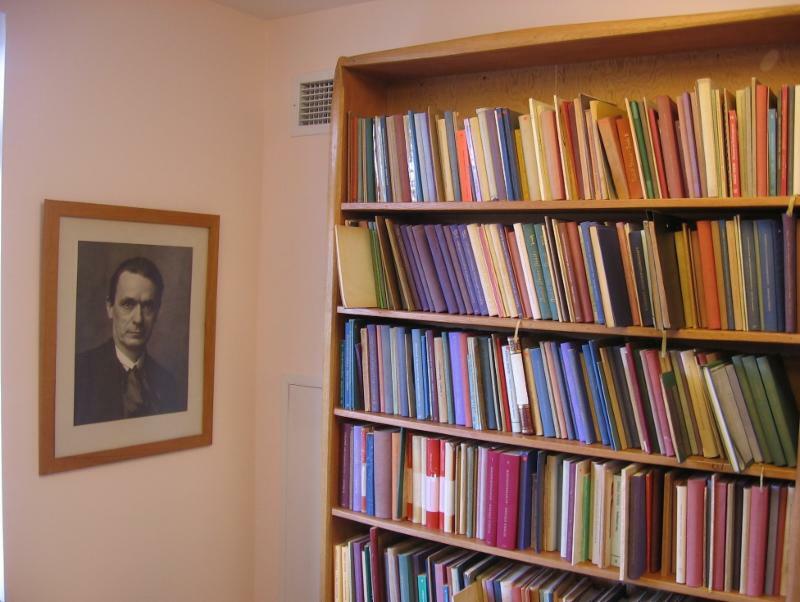 As a result of the move, we have a selection of duplicate Rudolf Steiner books and lectures that we are offering to Groups and Branches who may wish to add to, or start their own libraries. I would like to add that it is our intention to support the work in the Groups and Branches in any way we can. We would be interested to hear from you, the members, if you have suggestions about how we can be working together. The Toronto Branch of the Anthroposophical Society in Canada was delighted to host Reverend Jonah Evans, of the Thornhill Christian Community Church, who provided three excellent, highly original lectures on esoteric Christianity at the Metropolitan United Church in the heart of the city earlier this fall. The three lectures were organized by Theresia Schier and were held on September 17, 24 and October 8 with good attendance on all three evenings. Drawing on his deep understanding of Rudolf Steiner’s Christology and his years of experience as a Christian Community priest, Reverend Evans lectures built up a wondrous sense of Jesus Christ that touched the intimacies of the human heart and shed light on the great cosmic dramas of the evolution of humanity and the earth. In the first lecture, working with several powerful stories of human becoming, Reverend Evans traced the activity of Jesus Christ in the heart forces at work in moments of personal transformation. Quoting the Gospel of Matthew (Chapter 12, Verses 38 – 41) where Jesus Christ refers to the “sign of Jonah”, Reverend Evans explained that in addition to the macrocosmic event of the Christ Being’s descent into the centre of the earth, this sign also pertains to each of us as we encounter life’s challenges, as we descend into the heart of our own earthly destiny. He revealed a pattern in human becoming where we endure an experience of dying – of letting go in some way – and through this experience, give birth to a higher soul capacity, and take a step toward becoming ourselves. In the second lecture, Reverend Evans explored how the Incarnation was a healing event for human beings, showing how the life of Jesus Christ restored the archetype of the human being, thus infusing humanity with the power to undertake the ascent back to the spiritual world. He showed how this process of working toward spiritual development requires us to work together in this world - which we must take up the healing work in relationship to each other, and as communities. In this context, he explored the meaning of illness and death, karma and reincarnation, showing these as gifts that can help us achieve a greater victory. In the third lecture, Reverend Evans moved to macro- cosmic level, drawing out a magnificent picture of how Jesus Christ is working now as the driving force in the evolution of the earth itself. It was an amazing experience to move from the personal, to the social, and to the cosmic in a way that linked our day-to-day challenges with these great forces, to gain a glimpse of Jesus Christ as both intimate guide and world-shaping power. “What is really at the core of Hesperus' mission is to explore, develop and support what is truly human. It's like the snowflake. Each snowflake is the same - and different. And that's also the case with human beings. Each of us has our own path. With the vagaries of life, the individual can very often be suppressed or wounded to the point where the sense of meaning in life - the thread of the biography - is lost. We are very committed to trying to help ourselves, and those who come to us for care, to find that thread again. And it's a mystery really, how each of us does that. And through the various modalities we have, we try to support the individual in the journey, and to help them somehow to reconnect, to deepen the connection with their biography, so that life becomes precious again, not just a waiting, but a precious adventure of becoming more human.” Kenneth McAlister from the Hesperus video. Link. Is the above quote why you came to Hesperus in 1990 or has this philosophy evolved over time? Is anthroposophy at the core of your philosophy on ‘ageing well’ - on care? Could you explain, briefly, how anthroposophy has contributed to your way of working in the world? DONATIONS. To make a financial contribution to the Society, click on the "CanadaHelps" button below, and make your contribution using a credit card. FULL-TEXT ARTICLES written for our monthly eNews appear in the right column of the blog. To locate specific articles, click the "Index of Full-Text Articles" below, or use the "Search" box in the top-left corner. If you can't find what you are looking for, check the Sidebar (Archive of past issues, and Downloads). Feel free to contact the editor (infoATanthroposophy.ca) for help anytime. BACK ISSUES. To retrieve any issue of the eNews, click the "View Our Archive" button below. FORMS and NOTICES. To download forms and notices, see the "DOWNLOADS" section below. BIBLIOGRAPHICAL RESOURCES. Links to helpful reference tools for anthroposophical literature. Click on the button, and select "membership contribution" from the drop-down menu. If you want to make additional donations, repeat the process and select the desired fund. Thanks! * CanadaHelps charges a fee of 3.9%. * CanadaHelps processes your donation and immediately issues a tax receipt for the full amount of the donation. The donation cannot be refunded. * CanadaHelps (not our Society) will appear on your credit card statement.